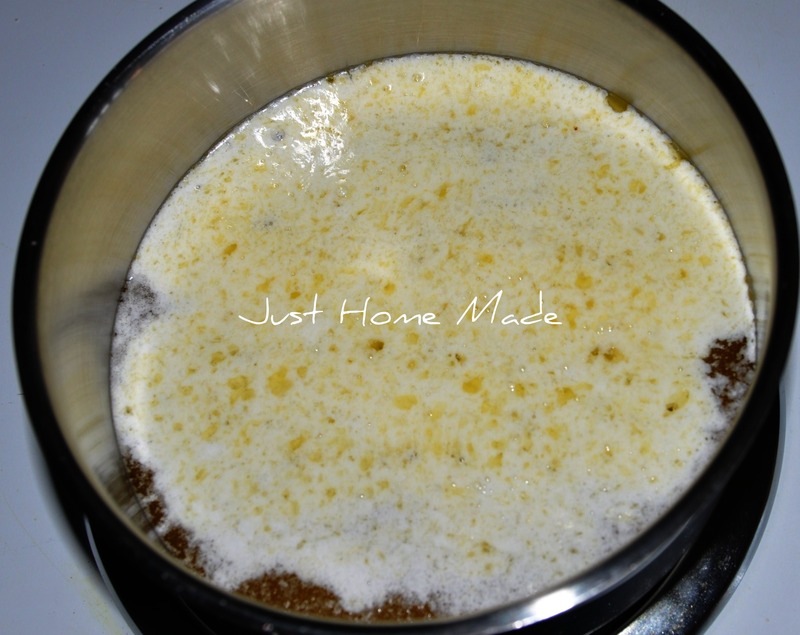 Ghee is an integral part of Iyengar cooking and a must have in most Indian kitchens. In fact, a traditional meal when served, does not get a go ahead to be eaten until ghee is drizzled over. Ghee has more of a sacred role in the Indian culture than that of a mere food flavor enhancer. It is an unsurpassed choice for lighting lamps used in worshiping and any food offering to God is always sprinkled with Ghee. It is even considered as a sattvic food to nourish the spiritual soul. The best ghee it seems, is known to be made from a free-range grass-fed cow’s milk. I have had enough and more of my fair share of Ghee having grown up on a daily potion of it. Ghee that smells, tastes as well as is good for you is really hard to find in stores. 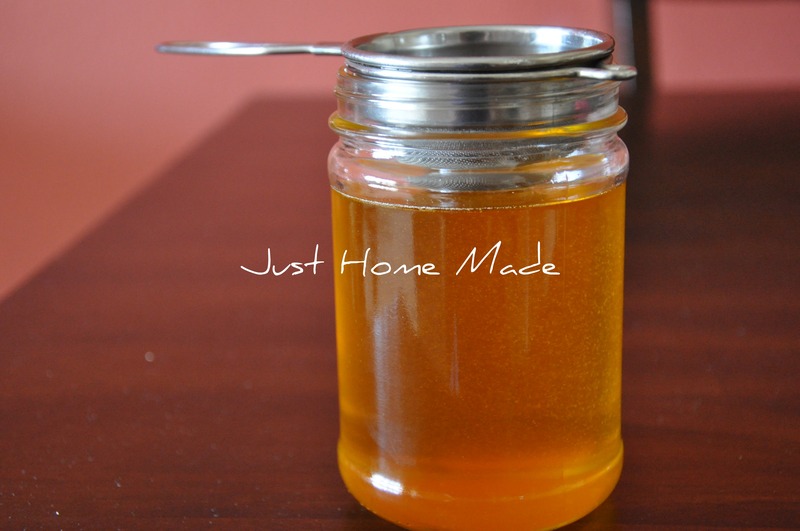 So, I always swear by home-made Ghee, a purist’s dream come true. 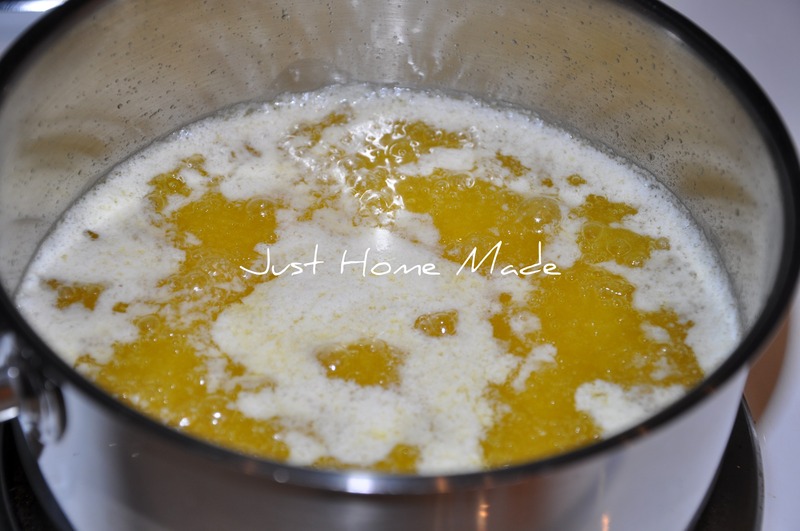 Ghee is most often passed off as clarified butter. I do not want to get into an argument over it, instead, I will say this for sure. Ghee is far superior than butter in many aspects. Unlike butter, Ghee can be heated to higher temperatures without burning. Characterized by it’s clear golden-yellow color and a signature aroma, when used in cooking, it adds an unparalleled flavor and taste to whatever dish it is in. It has a wide range of uses in Indian cooking like sautéing, tempering, making sweets or quite simply drizzled over a wide variety of food Rice or Chapati, Naan or Roti and many more. Ghee alongside butter has received a lot of bad press in the recent years because of it’s perceived saturated fat content. However, as per Ayurveda, Ghee is believed to have superior medicinal properties and is considered as brain food, a good information source is here. Ghee making in itself is as much satisfying as eating it, especially when the mellow aroma of the simmering Ghee fills your kitchen. Once you start relishing your favorite dishes with Ghee, there’s no looking back. Mavilakku, Tasty Vegetable Pongal, Obbattu are a few of my recipes that have Ghee in them. So, what say? Ready for Glee..err Ghee? I prefer Organic Butter as it is free of rBST and additives including natural flavors and with it is the closest we can get to make pure Ghee. As the butter boils and simmers, repeatedly skim the milk solids into a separate bowl until all the solids are ladled out. This way, the milk solids are not allowed to settle at the bottom and hence, there is no chance of milk solids burning. Let the butter do all the work boiling and simmering; water evaporates out and eventually, the milk solids become heavier and sink to the bottom. Let cool, strain thereafter and store for later use. I have made Ghee with both the methods. I chose to explain the latter, as we can get the same end result with much less work on our part. Who does not want a shortcut, right? Well, it sure needs you to keep a watch as most of the cues are visual. So, keep your eyes peeled and never leave sight of the boiling butter. A little patience goes a long way in Ghee making. So hang on. 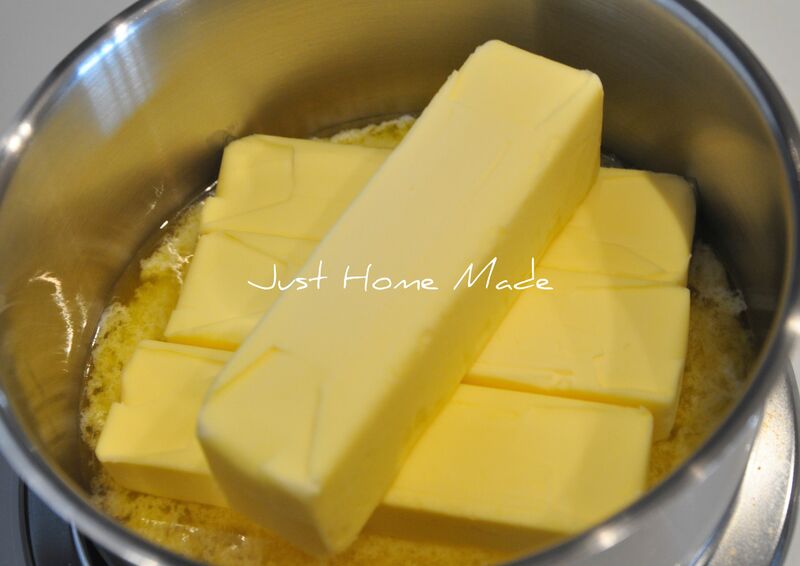 Unwrap and place the butter sticks in a clean thick bottom saucepan over medium heat. Do not let the saucepan heat up before placing the butter sticks, as the butter burns before melting and ruins the taste of the end product. Let all of the butter melt in the pot. It is important to not cover the pot throughout the ghee making process as the water content in the butter needs to evaporate. At this point, the lighter mixture of milk solids combined water globules float to form an off white layer at the top. Over medium heat, let the melted butter slowly come to a boil. Do not increase the flame/heat beyond medium at any point. As the butter boils and water content evaporates, the soft milk solids start to dis-integrate. As the milk solids separate out, more of the yellow fat portion is visible now. Brace yourself, ‘cos the boiling butter can get violently noisy and the bubbles might even start bursting out a few times. There’s no need to fear though. Reduce the flame/heat a bit and here on, stir every now and then with a clean dry ladle to keep the solids from sticking to the bottom. Soon, all the water has evaporated and big foamy bubbles start to form at the top. Notice how the big foamy bubbles cover the entire top surface. Now is the time to reduce the flame/ heat further and let simmer. From here onwards, changes are quick and fast, so stay right here. Notice how the big foamy bubbles give way to a large number of frothy little ones. Reduce the flame further to the minimum possible setting. If your’s is an electrical stove like mine, switch off now. The top layer is frothy white and the milk solids have browned, shrunk and settled at the bottom of the pot by now. Switch off the stove (gas stove). The thick bottom of the saucepan retains enough heat for the cooking to continue through the last couple of stages before Ghee is ready. Clear golden-yellow liquid with a little bit of foam floating around is a tell-tale sign that we are almost there. It is near sunset yellow in the picture because of the brown solids at the bottom. Be very careful to not burn the solids sticking to the bottom. Burnt solids totally ruin the aroma of Ghee and render it distasteful while all the patience shown so far will go down the dumps. Keep aside and allow to cool. Do not cover the pot until cooled completely. When cooled, strain into a clean dry glass jar and cover with an airtight lid. Ghee turns rancid when exposed to oxygen in the air. 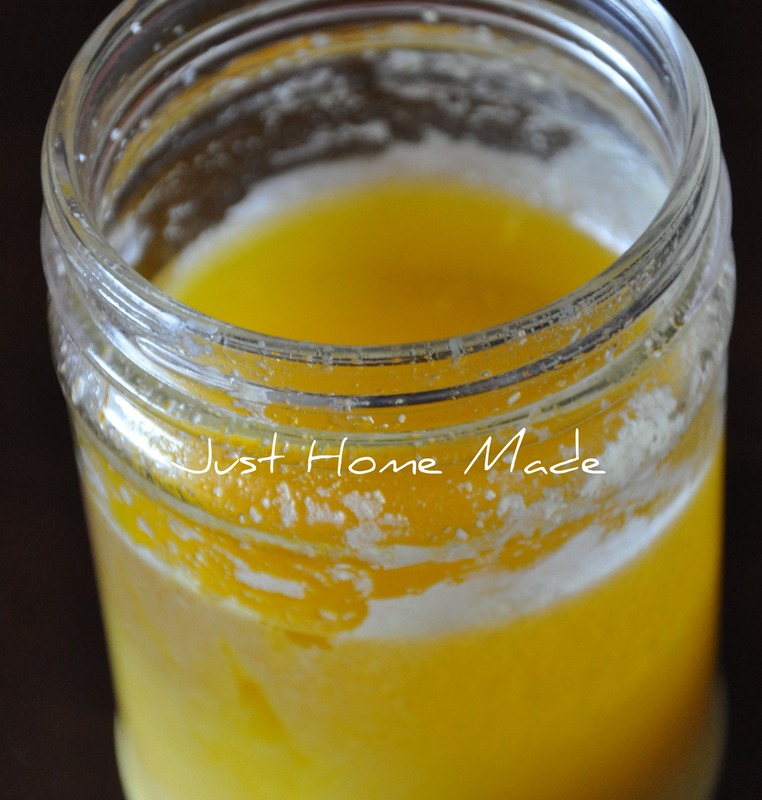 Ghee can be stored on the kitchen counter at room temperature, it should not be refrigerated. When ladling out, make sure that the spoon is not wet, as moisture is detrimental to the Ghee. 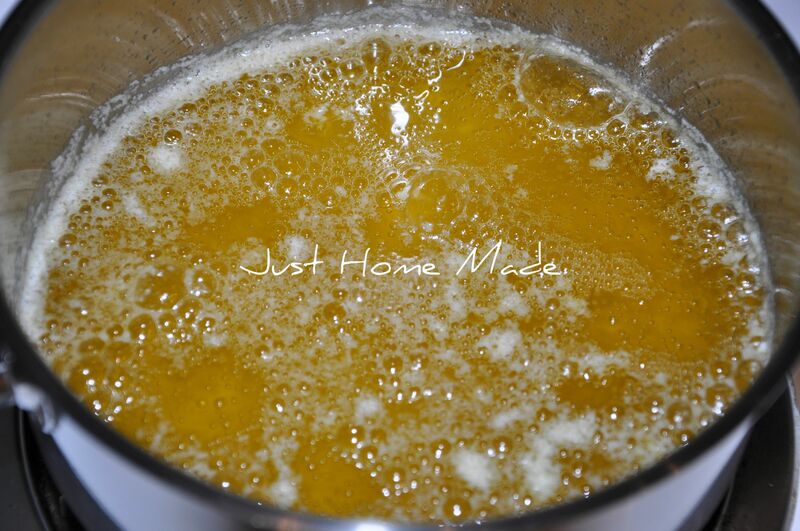 Though a liquid when made, Ghee settles to a more natural semi-solid state. 1/2 a tsp of sugar rolled into a ball with a few drops of Ghee soothes a sore throat. A tsp of Ghee, a tsp of sugar, pinch of turmeric and a pinch of ground black pepper blended into hot milk is brings relief to dry cough. This is a tried and tested home remedy. Make use of the left-over Ghee in the pot, before putting it away for wash. A few ideas but not limited to, include rinsing the pot with hot Rasam or scooping a ladle of rice into the pot and swishing it all around to coat all the ghee. A betel leaf dropped into the Ghee at the end imparts a refreshing flavor to the Ghee. This was done in my granddad’s place in earlier days. I tried my hand at ghee making a few days ago (not this recipe, but another) and all seemed to go well. However, while most of what I made has come to a semi-solid state in the jar, there is a small layer of liquid at the bottom. Is this right? Alana, congratulations on your ghee making! What color is the liquid at the bottom? It is not uncommon to find a clear golden liquid floating on top with a lighter (color) semi solid at the bottom. However, if it appears milkish white or watery and is intead on the bottom, I’m afraid that Ghee has not yet reached its final state. How does the Ghee smell? Does it smell a bit muggy? If so, another quick round of boiling on low-medium heat might help. Just make sure it ends in a clear golden liquid. And take extra caution to not burn it. * 1/2 a tsp of sugar rolled into a ball with a few drops of Ghee is believed to soothe a sore throat. Believed? You mean you have not experienced them work? How long does it keep on the counter before going off, and becoming unusable? 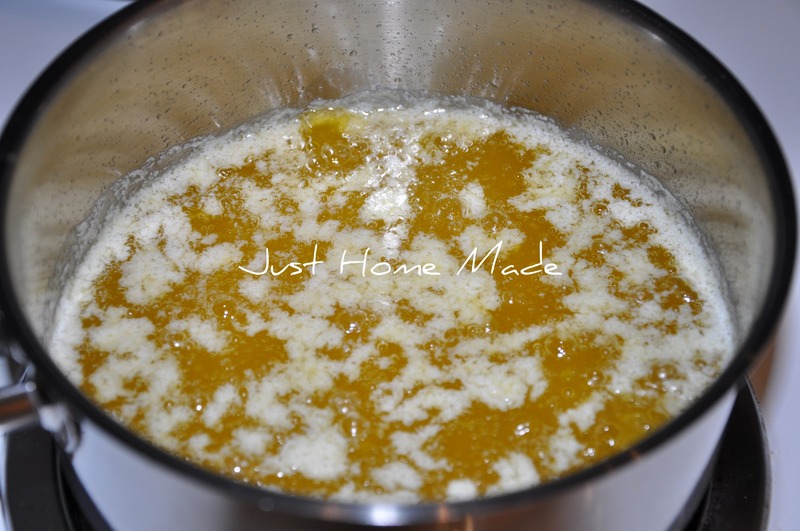 I am very interested in using ghee more often, but I have never had much luck in getting it to stay fresh very long. 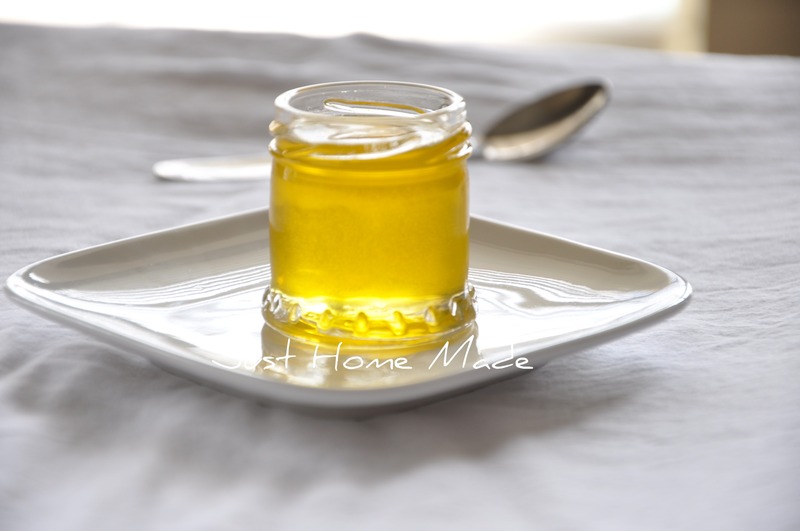 Ghee does not go bad for months when kept in an airtight container and devoid of moisture (a dry spoon is a must for each use). When you say, “not fresh for long” is it the smell or did it really become unusable with mold etc.. in which case, the Ghee had probably not reached its final state when prepared in the first place. 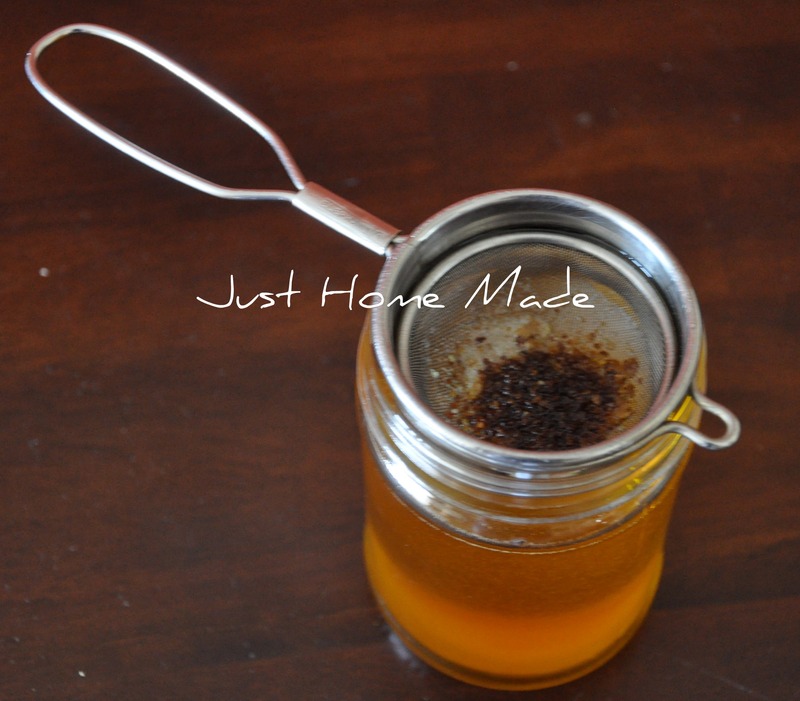 @Jojoninja – I guess there’s so much to love Ghee! I am all ears to hear how it turns out..
@Rama – I didn’t want to risk sounding like a doctor, not being one! It is a fact, much more than just belief in my personal experience. Hope that sounds good. Thanks for the tutorial! I recently discovered ghee since it’s casein and lactose free. It’s quite expensive at the store! I’m going to try my hand at making this soon. I just finished making Ghee with the help of your instruction. Thank you very much for the detailed description and for the photos which helped me alot. Have you ever heard of Smen? It seems to be similar to Ghee but from what I remember it has a strong smell and taste. Not to compare with mellow Ghee. So happy to know my Ghee making instructions were useful. I know, it can be a little tricky when making for the first time. Now that you have made it, the next time should be a breeze! Hadn’t heard of Smen before, learnt something new. It is so wonderful to learn that food cultures are quite similar even when far. Mom to a little girl equally gifted with gourmet taste buds, I can totally understand what a relief it must have been! So, thank you for sharing that with me. Hi! For a couple of months now, I’ve been making what I thought was ghee but really was clarified butter – the liquid at the bottom was white. I’d skim the stuff off the top, then put the jar in the fridge to harden, then make a hole through it to let the “milk” out! It was really just melted butter fat. Not bad, but not GHEE. Well, yesterday I tried your recipe. Wow! what a difference! The smell is heavenly, like really good butterscotch. I’m putting your link on my blog. The only thing I did differently was, I used a 1 quart CROCKPOT with Medium, High, and Warm settings. I used the High setting. It took about 4 hours but did exactly what you said it would. Thank you! 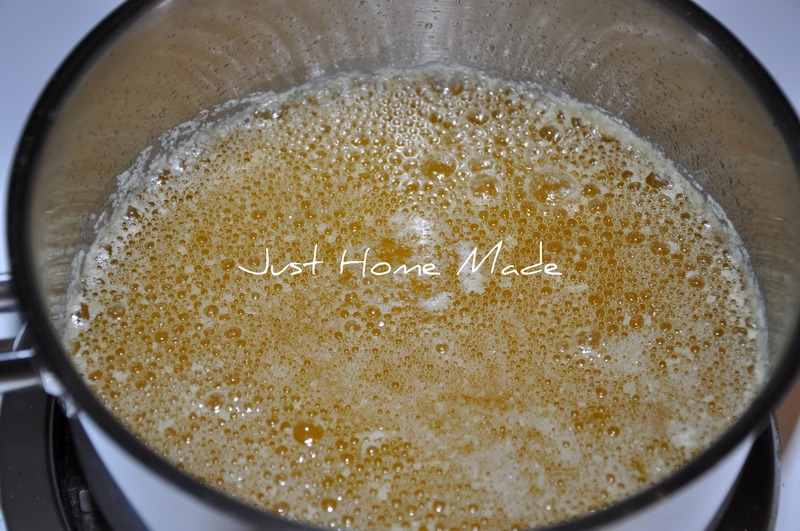 Making Ghee at home can be intimidating at the beginning if one has never seen it made by someone experienced. As much as it demands one’s patience and vigilance, it is a rewarding and satisfying experience, I’m sure you’ll agree by now. So happy to know that you got the desired results! 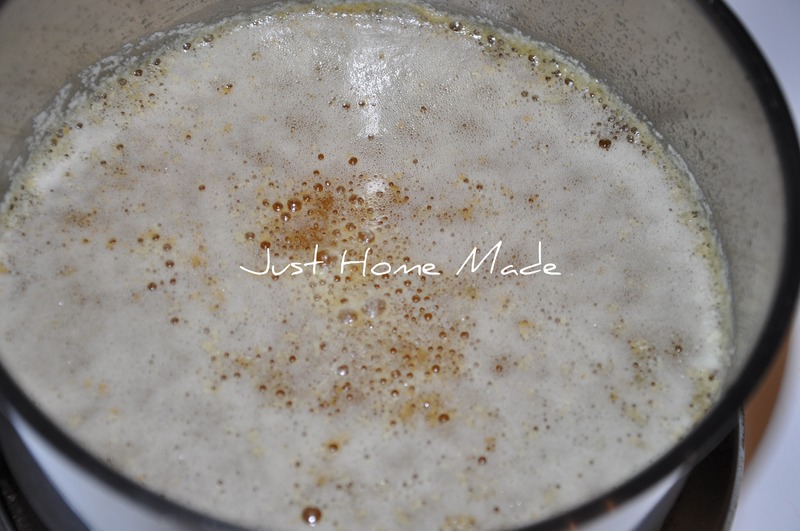 About the brown stuff at the bottom, it is never usually wasted when made at home (a couple of ideas are listed on this post itself, for it’s use). You’ve done the right thing by re-purposing it nicely. By mentioning GAPS nutrition protocol, you’ve introduced me to something new. Yes, Ghee is safe for use by lactose intolerant people as lactose is eliminated in the ghee making process. The burnt stuff is nothing but caramelized milk solids just like you’ve said. Hadn’t thought too much about the chemical composition part of it! Thanks to you, I got to learn more..
Also, I learnt that for those who are very lactose intolerant, it is better that the burnt remnants are strained away and not used as it could have trace amounts of casein and lactose. I do have one question: the brown stuff at the bottom, and the foamy stuff at the top – are they bad for you? They smell so good, I mixed the contents of the strainer with a little bit of honey and spread that on bread – it was yummy! I follow the GAPS nutrition protocol (gapsdiet.com), which eliminates lactose, hence the need for ghee instead of butter, since the lactose goes into the white liquid that caramelizes into the brown stuff at the bottom of the ghee. Any idea what happens to the lactose in this process? I would imagine it is this milk sugar which caramelizes, hence the brown color and the caramel flavor. I wonder what kind of molecule is caramelized lactose? It doesn’t taste sweet any more. Is it still a disaccharide? I usually make ghee the same way, but from homemade butter , from cream collected daily from milk. Once I just tried to make ghee directly from the cream. The results are the same except that there are more solids left. I just added sugar to the cream and heated it, till most of the ghee separated and the solids were light brown in colour. The ghee was quite good and the solids left were yummy too , almost like the milk cake we buy. That’s quite interesting to know Aruna..
I’ve not got to make ghee from cream as cream seldom separates from the milk here.. Haven’t tried from heavy cream either. But, i know that my mom would make it that way- of butter from home collected cream..
i just want to make sure i don’t do anything wrong. is just a regularly cleaned jar with a tight lid good? or do you need to sterilize the jar/properly seal it? thanks so much, this looks great! Unlike canning, there is no need to sterilize it. A well washed, clean dried jar with a tight lid should work well. Just need to make sure no moisture enters at any given point. Always use a clean dry spoon to serve ghee. Store it away from heat and direct sunlight in a cool dry place. Sorry to hear that Tina.. It certainly hurts to see so much butter/ Ghee in the making go a waste.. If you could tell me what exactly went wrong, I’ll try to help in any way I can.. Thanks! I am not sure exactly. The butter started boiling before the sticks had fully melted and so i turned the temp down, and I think that was the problem. It stopped boiling, so then I had to turn it back up to medium. I might start with some room temp butter next time, as our fridge is pretty full so it is keeping things super cold. Tina, The best part is, it doesn’t matter! I always plonk the butter bars straight from the fridge.. If not, start afresh.. Unless it is burnt at the bottom, (which does not happen until everything is done), you can continue where you left.. I didn’t hover over the pot this time, so I think that may have been my problem last time. Thanks for the tutorial, we are happy to have “butter” again! That is awesome! Happy to hear about your ghee making success! BTW, guess you meant to say “Ghee”! I made this – so nutty and yummy! Thanks for the recipe and the step-by-step instructions! It was so helpful 🙂 You’re the best, Radhika! A pound of butter would need at least half a gallon of cream I suppose. So, 3-4 gallons? You do the math..
What a budget saver! I cannot digest the milk solids in butter and had been buying ghee online, but it’s SO expensive! I will be making it at home from now on! Thank you! I made ghee last night for the first time. I’m very excited about it being something that doesn’t go rancid. When I put it in the jar, it was a lovely clear golden color. This morning, it’s a cloudy, pale yellow. Is it supposed to do this? I had a similar kind of euphoria when I made Ghee for the first time. I can totally understand your joy and sense of satisfaction. That is perfectly fine. Cloudy pale yellow is its natural room temperature appearance. It is not rancid as long as it continues to smell that lovely nutty smell and not musty. The flavor is amazing! I’ll be making more of this, for sure. Thank you!! 3- Coconut oil, an alternative healthy fat is becoming a real problem because of excessive palm tree production replacing rainforest areas. 4- I don’t think the ayurvedic medical knowledge is total nonsense and ghee is recommended by it. Thanks so much for these great instructions! I just tried it, for the first time and I´m curious what it will be like once it settles into a solid state. Only mine has a bit of foam on top in the jar. Is that okay? Great pictures! That’s awesome! Olga. It will turn into a light yellow semi solid once it settles. And if the room temperature is low, it will solidify too, which is normal. Skim off the foam, i’d say. My ghee is burnt.. its little smelly and brown.. any tips to fix it? A little brown is completely acceptable. In fact, I make sure to brown it a little so that there is absolutely no moisture left and we love the caramelized fragrance and taste! Hope you have strained the ghee into a clean dry jar. Can this be made with cultured butter or only the plain butter??? That’s an intersting question Yolanda. I have never tried making with cultured butter, it’s always been with unsalted butter. How does cultured butter taste? If you don’t mind, try making with a couple of tablespoons and let me know. I’ll super curious to know! I would like to correct my response after reading up a bit on cultured butter. If I am not wrong whatever we have in India IS cultured butter (butter is churned out of yogurt), though butter can also be made from sweet cream as is made here in the US. If that is the case, please go ahead and make Ghee. It should come out fantastic! My ghee has turned white after been left out over night. What did i do wrong? I made it with unsalted butter from the grocery store…. If it is creamy yellowish of semi solid to solid consistency, that is normal. Once heated it will return to its golden yellow liquid state. Store it away from heat and sunlight in a dry spot. Okay, I’ve made ghee twice following your tutorial and it has been so helpful to have all the photos, so thank you for posting this! I’m sure I couldn’t have made it without the very detailed instructions. I did have a question, my ghee came out very different the second time from the first. I did use good grass-fed butter the first time and the second time I used regular store (and salted!) butter. I know salted isn’t recommended so that could be the difference? The first time it looked very much like your final product. This second batch is much lighter in color and is more solid. The ghee seemed to come to the clear yellow/amber state and the milk solids were even more browned the second time (I was afraid to burn them the first time), but it just looks different. It still tastes good though (a little salty, though I don’t mind). Just wondered if it is okay or if I did something wrong? Or if it could be the difference in type of butter or salted vs. unsalted. Thanks! Lisa, It gives me immense happiness to see many people trying to make Ghee at home. After the first time, it doesn’t seem as difficult a task isn’t it? Fear is only until the first try. I’m so glad you made it twice. I personally prefer the solids a little browned, that way there is no chance for any remnant moisture. From what you say, it sounds fine to me. Results sometimes vary a little this side or that from brand to brand (butter), even when it is organic and unsalted. Also, if you think it is smelling or tasting burnt, next time you could add a sage leaf or rosemary sprig at the fag end, if you enjoy their aroma. Or keep it plain if you like. In South India, it is not unusual to add a sprig of curry leaves or a betel leaf for extra flavor. Thank you Radhika for giving us the best article on making ghee. 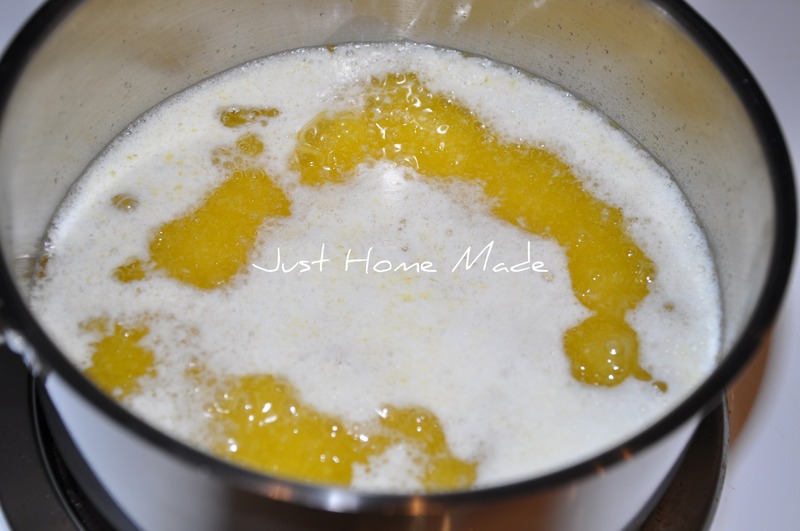 I love ghee, and I used to buy it ’til I decided to try making it at home. The first time it turned out perfect. The second time it has turned out very liquid, too liquid, so I reheated it and it turned out more nice than before. The third time I did the same as the second, but I burned it, and the fourth and final it turned out liquid again. Why doesn’t it get solid as the first time? Any suggestions? Thank you again. Great article! I just recently tried making ghee before reading your post. I noticed that it did not turn completely solid by the next day and it’s not hot, the jars feel cool to touch. Some parts solidified and others stayed liquid. I see you say that semi-liquid it fine. The solids turned brown at the bottom but I was wondering if I should have cooked just a little longer or if I did something wrong. I used raw organic butter from grass-fed cows. Thanks for this! I ain’t saying your information is not good., however what if you added something to possibly get folk’s attention? 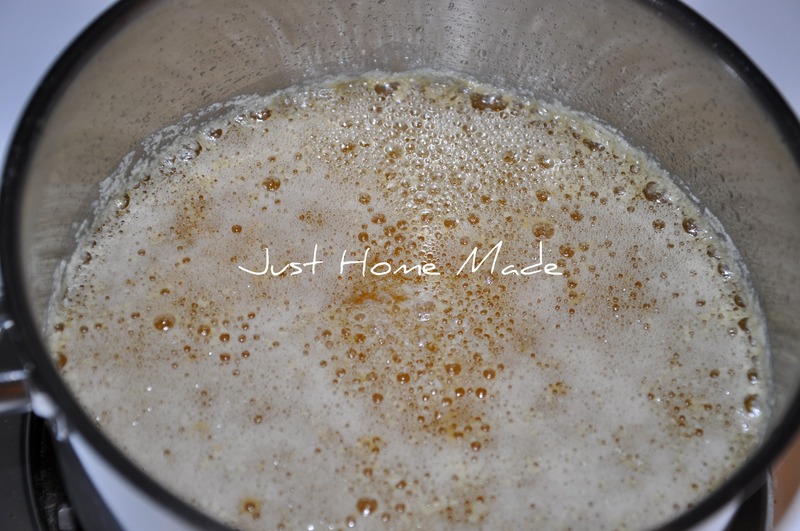 I mean Homemade Ghee | Just Homemade is kinda boring. You might glance at Yahoo’s front page and note how they create article titles to get people to click. You might add a video or a related picture or two to grab people excited about everything’ve written. I see that you have taken something totally out of context. 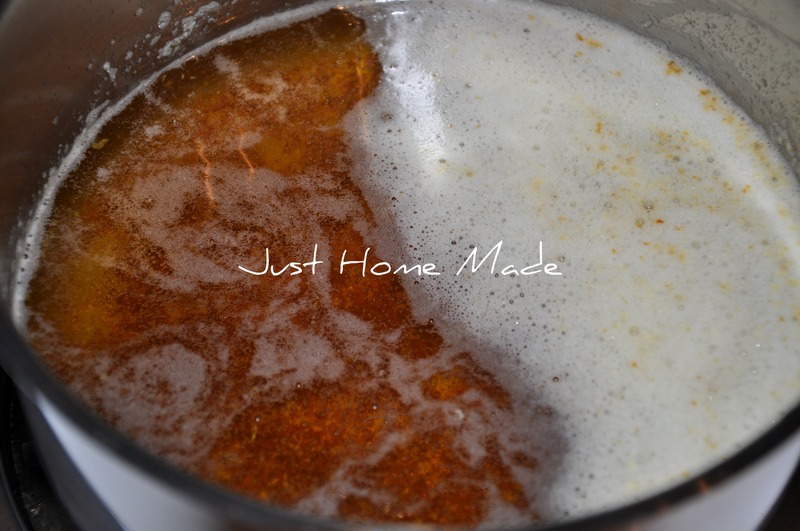 I write about my food heritage on this blog and Ghee is a very vital part of it. There is no offense meant anywhere in anyway to anyone and none is to be taken. Thanks for this. I was looking for a high heat oil for my son since he is not a fan of the coconut oil flavor with his gf pancakes or his scrambled eggs. Using your instructions I was excited to make ghee and it smells great. It looked golden yellow and the next day it semi-solidified to a pale yellow. I strained it with cheesecloth except there wasn’t anything burnt or brown at the end. Did I leave it long enough? Browning the milk solids just ensures there’s absolutely no moisture in there..
You could try that the next time.. It shouldn’t be an issue if it is used up soon..
Great directions! Thanks. Has anyone heard of adding some coconut oil to the ghee? It is supposed to give you a “best of both world” effect. I am afraid I’m hearing that for the first time! Ghee and coconut oil are awesome left to be just themselves..
Oh! Thank you so much Ahana.. So happy you wrote to tell me that! Enjoy the yumminess of Ghee..
Can u plz answer that IS THAT BROWN LEFTOVER NUTRITIOUS bcoz I have heard many people making dishes from it? Radhika, I wish I’d found and followed your directions for making ghee. I used the brief recipe from the GAPS book by Dr Campbell-Mcbride and ended up with some watery white liquid mixed in, despite my best efforts at filtering. I just opened my jar to find a bit of mold forming around the edges on the top. 🙁 I scraped it off and put it in the fridge. I am now wondering if the whole thing needs to be tossed, or if I can get away with reheating it to finish the process. Any advice on this? Heather, please toss it. And restart. I wouldn’t take any risk with mold. When made properly (all the moisture evaporates) and leaves no place for mold. Also, let it cool completely before storing away. I’ve tried making ghee but I end up with burned solids at the bottom and the color is off. What am I doing wrong? Lisa, Nothing to worry. You might be letting it sit on the stove a little longer. If the stove is electric and the utensil is heavy bottomed, switch off the stove when the liquid is golden yellow colored. let it go until the solids are wine red colored in the retained heat of the utensil. Thank you – I’ll try that. Do I need to stir? I did it, I finally made some respectable ghee. Thank you! That is Awesome! I know how good that must feel Lisa..
Hi can you please advise, I made Ghee a several times in the past and the outcome was great consistent solid ghee (after cooling). Yesterday I made ghee the same way using very good butter, but the outcome today after completely cooling is still not solid, there are two layers of liquid in the jar, bottom is grainy white semi-solid “pastry”, on the top there is clear liquid, nothing is of consistent solidity. Do you have an idea what could have caused this? Maybe I made a mistake in the preparations? Thanks! Yan, I think it is perfectly fine both ways. It depends on two things. One is, at which point ghee was cooled. If the solids were browned or burnt, then ghee is more grainy with liquid on top. Second is also the ambient or room temperature. As long as it smells good and not rancid, nothing to worry! Actually it smells amazing and was really consistent when i filtered it (with a coffee filter)… However, what would be the way to avoid this texture? Slower cooking and cooling at an earlier stage? Thanks! My ghee got burnt and has a burnt smell. How can I correct it. Can I use this or just throw it away? Ouch! Vanita.. Burnt ghee is super guilt inducing, I know! Can’t keep, can’t throw..
Really, how burnt is it? Did you taste it? If it tastes burnt, there is little that can be done. 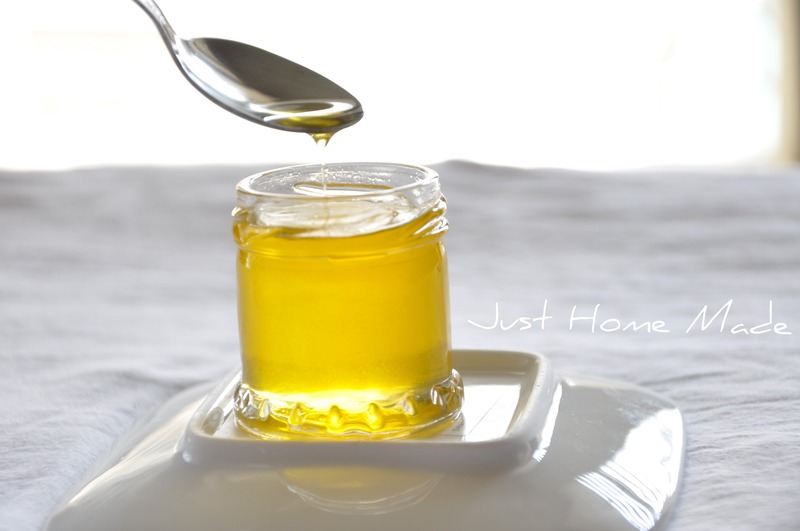 Burnt ghee (or anything) isn’t good for health. If it is too burnt, smells and tastes burnt, I’d not eat it. I processed the ghee in a water bath for storage. The partial jar of ghee was set aside without processing solidified beautifully. The ones I processed remained liquid. Any ideas on why and if one is better than the other? Rupali, how does it smell? If it smells fresh and not rancid, I’d use it. If it smells rancid, do not use. respected madam we have a 2kg stored ghee its unfortunately smelling what we can do ,is there any home made remedy to improve its fragrance . The techniques you wrote about Ayurveda is too good. I am very happy and impress to see your site. Thanq. Rob, Thank you for featuring my favorite ingredient!